Wellness: Being healthy in body and mind, especially as the result of deliberate intention. Integrated: Achieving a harmonious interrelated whole by coordinating separate elements. Despite living in an age that demands quick answers and a pill-popping approach, the synergistic combination of basic wellness factors may prove more effective for healing our mothers-to-be and their unborn children. Pregnancy offers a unique opportunity for re-establishing wellness. There are three unsettling trends in the modern world of baby-making. One, many couples cannot get pregnant. Infertility is defined as the inability for a couple to conceive after trying to do so for longer than one year. The U.S. infertility rate is one in eight, according to “Reduce Chemicals to Increase Fertility” on WebMD. Other modern countries like the U.K. and Canada now have rates that are even worse. According to an article called, “‘Infertility Time Bomb’ Warning” from BBC, that figure in the UK is one in seven and Assisted Human Reproduction Canada puts their country’s figure at one in six. And rates are steadily rising everywhere, as are the recognition of problems associated with assisted reproductive technology (ART). Two, if a woman is able to conceive, there is a significant chance that pharmaceutical drugs or surgery will accompany her labor and delivery of her child. One in three women will be given the minor surgery called episiotomy and another one in three will have the major surgery called C-section. Various drugs will be administered to the majority. Three, after climbing the hill of conception, pregnancy, labor and then delivery, the risk of the child fast succumbing to developmental disorders and disease is profound. Autism, ADHD, asthma, obesity, diabetes, and cancer have been rising over the last few decades. These facts put evolution at stake. How much longer can humanity support the rising trends of infertility, labor difficulties and infant disease? Science increasingly proves that disorders like these are a multifactorial combination of stress, environmental factors and personal health choices. Evidence for a preventive and integrative approach has been mounting. Causes for both infertility and infant and childhood disease have brought prenatal food choices, pharmaceutical drug usage, toxic household products, and perinatal stress to the forefront. Another example is an Infertility Fact Sheet published by the U.S. Department of Health and Human Services Office of Population Affairs (OPA), which answers the question, “What decreases the chance of getting pregnant?,” with these preventable causes: stress, poor diet, drugs, environmental toxins, among others. In other words, big governmental agencies around the world have already established that infertility and infant disease may be due to pre and peri natal conditions and choices that parents make before and while pregnant. And the solutions are found in stress, nutrition, environmental toxins, and overall maternal health—four “medicines” that are difficult to bottle and sell. The bright spot is that these areas neatly comprise a very useful list of wellness approaches that can begin immediately, and for little cost. Incorporating de-stressing techniques, reducing household toxins, remaining well-hydrated, eating natural foods, and moving daily are significant action items that every pregnant woman can immediately implement. Finding a method of de-stressing and actively changing negative emotions to honest positive emotions may be the most important step of all. “Positive maternal emotions have been shown to advance the health of the unborn child,” says Thomas Verny, MD, author of Pre-Parenting, Nurturing Your Child from Conception. Dr. Verny is the founder of the Associations for Prenatal and Perinatal Psychology and Health (APPPAH) and the Pre- and Perinatal Journal, and is considered one of the world’s leading authorities on prenatal psychology. He continues, “…thoughts which infuse the developing baby with a sense of happiness or calm can set the stage for a balance, happy, and serene disposition throughout life.” Although a multitude of methods exist, from visualization to meditation and prayer, finding one that works for you is the key. Choosing natural household products and cleaners is another big step toward finding prenatal wellness. Many people do not realize that most of their dangerous environmental toxins are usually ones they’ve brought into the home themselves. Filter your drinking and shower/bathing water. When buying soaps, shampoos, deodorants, toothpaste, lotions, household cleaners and detergents, sunscreen, and bug spray, look at the ingredients and do not buy it if you can’t pronounce an ingredient, or if you do not know what the ingredient is. Be especially cautious with cosmetics and air fresheners. Natural alternatives are so numerous at this point that it is relatively easy to swap products. Do not put lawn pesticide/fertilizer treatments on any lawn that you may want to walk through or otherwise enjoy. Drinking water is the first nutritional component that most pregnant women should consider, since the majority is significantly dehydrated prior to conception. Once pregnant, the developing fetus places enormous demands for water. The importance of water in the pregnant body is further emphasized when one considers the following jingle: “The solution for pollution is dilution.” Water is needed to flush daily cellular (and other) toxins away from mother-to-be as well as baby. Then there are the foods we eat. In a nutshell, it seems wise to choose natural unprocessed “in-tact” foods that are not grown with chemicals or pesticides. “The diet we enjoy in the twenty-first century differs markedly from the diet enjoyed by past generations,” says Carol Simontacchi, certified clinical nutritionist, and author of The Crazy Makers: How the Food Industry is Destroying Our Brains and Harming Our Children. There is one additional factor that seems likely to make a marked difference in the health and wellbeing of our pregnant population and incoming infants. Twenty years of research was performed by Dr. James F. Clapp, III, and published in Exercising Through Your Pregnancy, now in its second edition. It can be argued that daily movement is essential to the wellbeing of animals and humans alike, but Clapp’s research has forever changed the horizon for pregnant women. The percentage improvement in drug-administration and surgery during delivery is astounding for women who exercised, and is detailed one after the other in Clapp’s book. In addition, “All aspects of growth and development after birth in babies from exercising mothers are equal to or better than those observed in the [offspring of mothers who did not exercise. ]” writes Clapp. If you are pregnant or want to become pregnant, applying some, if not all, of these foundational components is critical to ensuring an improved outcome. Plan the last five or ten minutes each day with some kind of mental imagery. Take time to find positive feelings about life and letting stress dissipate. Choosing natural products is as simple as making a list and then spending an afternoon visiting a natural grocer or finding new products online. Drinking half your bodyweight in ounces (70 ounces for a woman who weighs about 140 pounds) every day is the action item for making sure you remain well hydrated; it is important that this is water, as nearly all other fluids have a dehydrating effect. Eating natural foods means eating more like our ancestors: vegetables and meats first, all other foods second, and flours/sugars/chemicals as little as possible. As far as exercise goes, health can be maintained with as little as 30 minutes daily of something as simple as walking. 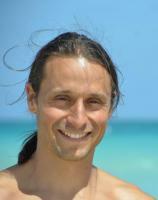 James Goodlatte is the founder of Fit For Birth, Inc., and a Pre & Post Natal Holistic Health Coach. His passion is to heal families by inspiring the use of natural methods and by building a team of fitness professionals to reduce infertility, avoid mechanized childbirth, and lower chronic disease in our infants. Fit For Birth provides continuing education courses for fitness and birth professionals, as well as various personal training and health coaching programs for pre and postnatal women.